The rich and famous can provide inspiration when it comes to sapphire engagement rings for brides of any background. The U.K.’s Daily Record and Sunday Mail showcases a photo gallery of celebrity engagement rings, from iconic Hollywood actresses to British royalty. Perhaps one of the most famous engagement rings in recent memory is that of Kate Middleton, who married Prince William in 2011. The gorgeous 18-karat sapphire engagement ring set off a royal frenzy when it was first unveiled. Brides can choose from several engagement ring settings accented by sapphires at Ziva Jewels. 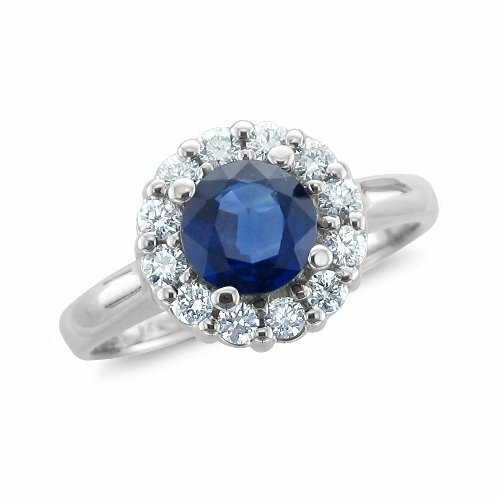 If you are looking for sapphire engagement rings similar to Kate Middleton’s gorgeous ring, the Art Deco sapphire ring with moon-shaped stones and pave is available in 18k white gold. “Pave” is a setting where stones are set like a paved street. This is an incredibly popular trend in celebrity engagement rings. The technique is used for small stones, usually diamonds, which appear to float in an invisible setting because no metal should be visible between the settings. Another popular setting when it comes to sapphire engagement rings is the double halo setting, which encircles a sapphire with two halos of diamonds. The sapphire ring with double halo (seen below) sets off a blue 1.5ct sapphire with a sparkling halo of diamonds for an unforgettable engagement ring sure to please any bride. The ring is available in 18K white gold. For brides who prefer a traditional diamond engagement ring flanked by sapphires, Ziva Jewels features several rings with a dash of color to stand out from the crowd. The vintage pear shaped engagement ring with sapphire side bevel sets and pave trim showcases a center diamond with two sapphires for accent color. This entry was posted in Diamond rings, Engagement rings and tagged blue sapphire, diamond engagement rings, kate middleton, sapphires engagment rings on July 14, 2013 by erika.